I just got back yesterday from John Gray’s Ranch here in California. We had a great time talking about how Men are From Mars and Women are From Venus. This guy knows a LOT about nutrition and how men and women’s needs differ. I shared my book The Secret Language of Feelings with him, and he said that he really like the principles that I discussed with him! 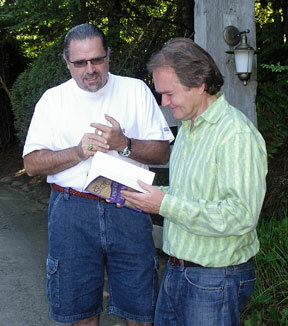 Sharing my book with John Gray. By the way, John Gray is totally into my “secret weight loss program” and he recommends it! Wow, this is great stuff! Thanks John for teaching me so much!